Here is a typical healthy digestive system of a human body. 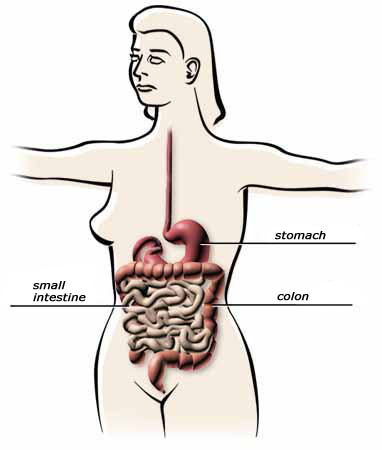 The stomach, small intestine, and the colon (large intestine) are primary parts of the system. Each of these organs are a system unto themselves, and disease causes an organ to not function properly. Many aspects of someone's life may be affected by disruption of one of these organs and their systems. Surgical intervention is a last resort to treating diseases such as Ulcerative Colitis, Crohn's Disease, or cancer. The steps of a J-pouch surgery are illustrated here, just click the arrow button.